ISLAMABAD, July 20 (APP):Caretaker Finance Minister Friday said that improving the quality of local products at par with international standards was imperative to discourage imports into the country. The minister was talking to a delegation of the Pakistan Business Council (PBC) led by Ehsan Malik and Bashir Ali Mohammad that met her here, according to press statement issued by the ministry. She said that private sector should explore options for boosting exports and avail opportunity offered through establishment of Special Economic Zones. 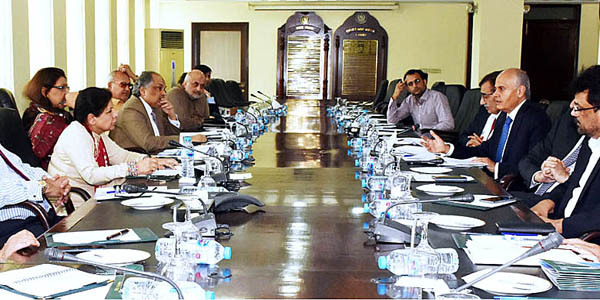 The minister appreciated the proposals put forth by the delegation, saying these would be valuable for the future elected government, urging PBC to send their detail tax and other proposals to government so that work could be initiated by relevant ministries for consideration of new government. The Minister agreed on the need for a more effective stakeholder consultation mechanism, adding that Pakistan industry needed to examine all options of managing their competitiveness. She agreed on need for dealing with root causes of the energy liabilities such as transmission and distribution losses that have aggravated the circular debt problem. and steps that could help boost different sectors of the economy. that have resulted in high cost of power to industry. The delegates called for reduction and simplification and reduction in the number of taxes through unification of multiple taxes and reduction in tax rates to strengthen tax compliance. The delegation observed that there was a need to effectively tap the potential in the country’s housing sector as it could help generate a large number ofjob opportunities annually. and consensus from various quarters concerned. Among others, the meeting was attended by secretaries of the Ministry of Finance, Ministry of Planning, Development and Reform, the Ministry of Energy and Chairperson Federal Board of Revenue and additional secretary of the Ministry of Commerce.